If you’re going to school, college or uni this autumn – or if you’re looking after someone who is, now’s the time to get ready. And if you’re a teacher with a classroom to kit out, or if you work in school or college admin, you’ll know just how important it is to be prepared before the academic year begins. 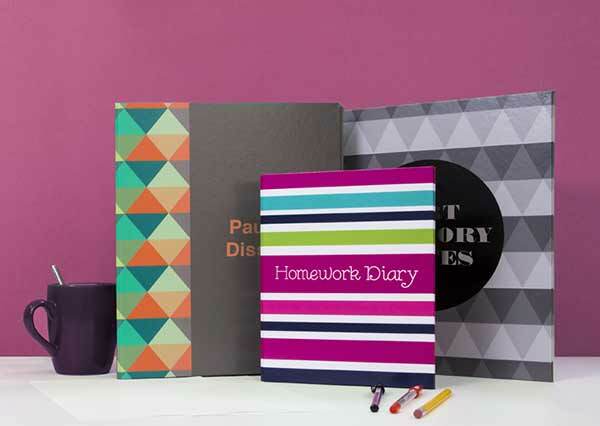 Here are four essentials from Avery WePrint to help you get organised, whether you’re a student, parent/carer or a professional in education. The contents of your files can be really precious when you’re a student, so it makes sense to have them easily identifiable and protected in a quality ring binder. Teachers and members of staff know only too well that there’s always plenty of paperwork and that it needs to be well organised. So it’s well worth investing in ring binders that can be used year after year. When it comes to working on a special project, there’s nothing more impressive that presenting it in a custom printed ring binder. These are also a great way to keep artwork that children have created in pre-school. You can print your own words and designs right across the outside front, back and spine with Avery We Print custom ring binders for a really stunning effect. Use your own artwork or our free online tool with professional templates. Suitable for A4 contents (or smaller) our range of ring binders starts at from 15 mm thick files (just over ½ inch), to lever arch files of 65 mm (over 2 ½ inches). You can also choose between a matt or gloss finish. For files you want to use over many years, or which need to be tough, Avery WePrint ring binders are premium quality. And the more you order, the bigger the discount. Do you want to label items that could go missing, such as books, clipboards and other personal or school equipment? Would it help to label cupboards and drawers so that everyone can help put things away? Labelling is essential. And in schools, custom labels are also great for creating special praise stickers to tie in with the school’s own reward scheme. Personalising high quality sticky labels couldn’t be easier with Avery WePrint. We use high quality materials and adhesive for sticky labels so they’re tougher and last longer, making them a worthwhile investment for students, schools, colleges and pre-schools. These sticky labels come in square, round, oval, rectangle, straight oval and plaque shapes. Sizes range from small to large and they can be made from paper or plastic film (polypropylene), which can also be clear. You can have your labels printed right to the edge for that really professional look, with a matt or shiny finish. Use your own design or find a professionally designed template with our online design tool. Even through we’re living in an electronic age, printed cards are just as important as ever. Do you need to make sure parents know how to contact you or the school? Are you doing research, and wanting people to contact you? Whatever contact information you need to give out, business cards are always the perfect answer. To help ensure your businesses cards can withstand the bottom of bags and pockets, ours are all made from high quality 340gsm cardstock. These small cards can be single-sided or double-sided in square or rectangular sizes. You can also choose to have them folded or flat, and they come loose or in pads. Business cards are simple to design using your own artwork or our online design tool. Keeping notice boards in order can be a major job, whether in the home or at school or college. They seem to fill up so fast and important information can easily get hidden. This is why wall signs are so useful for key messages. These large stickers are cleverly designed not to leave any residue on walls and use photo quality digital printing to enhance the appearance and make them last longer. You can print wall signs with words or uploaded images. Motivational quotes or quotes from great writers and philosophers can be inspirational for school and college students, while simple pictures, letters and numbers are perfect for infants and pre-schoolers. Wall signs are, of course, just as useful for simple instructions, such as reminding people to clear up, or for directions. Choose from rectangular, round or square wall signs. Rectangular sizes start at A5 and go all the way to large poster size, A0 (841 mm x 1,189 mm or approximately 33 x 47 inches). The round ones are 350mm diameter (about 14 inches) and the square ones are 400mm (about 16 inches). We hope we’ve given you some ideas for a successful year ahead. We’d like to wish you all the best whether you or your children are about to start a new school, go into a new year or study for exams. If you’re teaching, lecturing, running a pre-school, working in the school office or helping in some other way, we hope you have a great year ahead. We’d love to hear from you – please let us know how you’re using Avery WePrint products to help support learning in your home, school or college by contacting weprint.uk@avery.com.